Did French officials downplay nuclear incident? Is French media now? 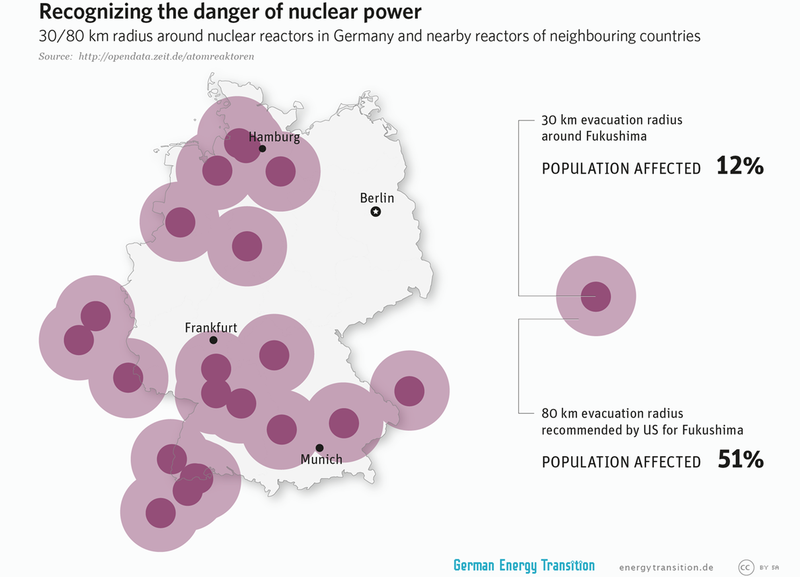 Last week, German media reported that the shutdown of a reactor in Fessenheim, France, should have been classified at a level of greater danger. While the German media focus on the event itself, French media have turned the issue into a “he said, she said” dispute. The coverage reveals the tradition of transparency in Germany – and the lack thereof in France. By Craig Morris. Update: Housing Minister Emmanuelle Cosse now says (in French) that Fessenheim will be closed this year. It is unclear how this issue falls under her mandate. If true, one immediate effect could be that the important questions listed below might never be answered. Both reports refer to a letter sent by French nuclear safety authority ASN to the reactor’s director. It explains the findings of its review. Essentially, water had entered an electrical cabinet, damaging some equipment. Engineers were then unable to move the control rods used to ramp the reactor up and down. In order to shut off the plant, which had essentially become uncontrollable by normal means, boric acid was poured into the reactor for an emergency shutdown. Both German reports cite German nuclear expert Manfred Mertins, who says that he knows of no other such emergency shutdown using the introduction of boric acid in Europe. When I first saw these reports, I assumed that an insider had leaked the letter to Mertins, who had then gone to the German press. I wondered who was behind the leak and why that person, no doubt a Frenchman, would contact a German instead of someone in his own county. Then, I would want to know whether the German was right – did French officials play down a nuclear incident? The problem with most French press reports is that they give readers the impression that the dispute runs along national lines, with the Germans asking the French to do something France doesn’t want to do: shut down Fessenheim. The real issue, however, is whether the incident in April 2014 was indeed played down. “Borification” is the introduction of boric acid to the reactor. The process is called “poisoning the reactor.” Adding boric acid to a reactor that has lost control of its control rods is extremely rare. There are some 440 nuclear reactors technically in operation worldwide (including the roughly 40 not currently producing power but not officially shut down either in Japan). I could only find two previous instances of such an event. One of them was at Fukushima; the other, at Kosloduj, a reactor in Bulgaria. The story from Bulgaria is illustrative (PDF in English from a nuclear watchdog organization). When three of six control rods in a cluster did not move, “workers pumped boric acid in to prevent a chain reaction.” Just to be safe, the engineers then decided to conduct an emergency shutdown – only to find that 22 of all 60 control rods remained “stuck in the highest position.” They flooded the reactor with boric acid. The story was initially covered up, being reported only as an INES 0 incident. The International Nuclear Event Scale (INES) goes from 0 to 7. A whistleblower reported the matter to German daily Tagesspiegel (report in German), and a subsequent investigation raised the category to INES 2. The ASN categorized the event in Fessenheim as INES 1, not INES 2. Is there a big difference between the event in Bulgaria and the one in France? That question would be an excellent one for French media to investigate. INES 2 is partly defined as “significant failures in safety provisions but with no actual consequences”; French media should call on the ASN to explain why the inability to move control rods does not constitute a “significant failure in safety provisions” – and why the emergency shutdown using boric acid was apparently not reported to the International Atomic Energy Agency (IAEA). This press release (in French) make the event sound relatively harmless; there is no mention of boric acid being needed. Indeed, the wording makes it sound like only system A was damaged, whereas system B (the redundant backup) worked perfectly, suggesting (incorrectly) that the control rods were controllable the entire time. Another item that deserves investigating is whether the use of boric acid damaged the facility in any way; apparently, this can be an issue. This different focus between German and French media speaks volumes about the different culture of transparency pertaining to nuclear issues in the two countries. It is noteworthy that the Bulgarian incident also first went public in German media. This time, French media failed for 23 months to realize that they have a potential story on their hands. Of course, German Environmental Minister Hendricks has to repeat her call for Fessenheim to be shut down ASAP under the circumstances; she protects the interests of Germans. (Disclaimer: I live 21 km from the reactor as the bird flies.) Fessenheim is the oldest reactor in France and the only one literally on the German border (though others are quite close.) But in reality, the French nuclear sector is probably happy that it is being asked to respond to German calls for Fessenheim to be closed. As long as we keep talking about that, less attention is paid to the real issue of a potential cover-up. Yes, the Germans have reasons to be concerned about Fessenheim. And yes, the French public deserves greater transparency as well. The issue is especially touchy at the moment for the French nuclear sector. Fessenheim is to be closed whenever the new reactor at Flamanville is completed – if it ever is. Otherwise, French Ecology Minister Ségolène Royal wants to extend the service life of the French nuclear fleet by 10 years (report in French), probably including Fessenheim. Furthermore, there are increasing calls for a follow-up reactor of the Flamanville design planned in the UK to be abandoned, and a similar project in Finland doesn’t look so good either. All of this is putting a strain both on Areva, the builder of the reactors and France’s national champion for engineering, and on EDF, the country’s power provider. EDF has lost some 90 percent of its share value since 2008, and Areva has looked basically bankrupt to financial experts for the past year as the company fails to sell further reactors. The last one was sold in 2007. Having put all of their eggs in the nuclear basket, France now has trouble stepping away from it. Maybe the recent event in Fessenheim can be categorized as INES 1, and maybe even INES 2 does not mean that Fessenheim should be closed. Or maybe, given its reliance on nuclear, France cannot afford to ask whether a simple non-nuclear accident – water damage to electrical equipment – led to the use of boric acid, which may have aged the country’s already oldest reactor even further. Borated water led to problems at the Davis-Besse reactor in the US a decade ago, and that facility did not even have an emergency shutdown like Fessenheim did (and yes, the whole thing was covered up). The French press should start asking tough questions and stop making this a “he said, she said” issue between allegedly anti-nuclear Germans and the French. Don’t do it for the Germans; the French themselves deserve better than reliance on their German neighbors for investigative journalism. The financial chief of EdF quitted after the news of Fessenheim came up last week. This wasn’t due to financing problems paying for Hinkley Point C but to the general financial situation of EdF. The company has to write down an atom power plant in this years financial report and to start milking the financial back-up saved for this event. Which doesn’t exist in cash and not in full but was of course invested in their own plants …. similar to RWE and EoN in Germany. The power price (futures at the EEX) stepped up today with the news coming in by about 80 cents/MWh. Every little helps. 1) The water damage led to the control room readings of the positions of the control rods being nonsense. Therefore it was decided not to use the control rod drive mechanism to shut down the reactor gradually. 2) The system for emergency shut down is independent and consists of cutting the electricity supply to the electric magnets that attach the control rods to the drive mechanism. This causes an immediate shut down, as the control rods fall into the reactor core. This system was always operable. Last time I checked, gravity was pretty reliable. 3) It was decided to shut down the reactor gradually by using boric acid. In PWRs the use of boric acid for reactivity control is completely routine. After refuelling, a higher content of boric acid is used to counter the higher reactivity of the fresh fuel. All components that come into contact with primary coolant are designed to cope with boric acid. In BWRs, boric acid is only used in emergencies, as it would damage the turbine. 4) The German press is not only allegedly anti-nuclear, but has been conducting a witch hunt on nuclear power since the 80s to help the coal industry. One look at the title page of “Wachstum und Wohlstand ohne Kohle und Uran” is enough to work out that the energy transition is all about transitioning to coal with a bit of renewable greenwash. Shame that this is killing the planet. Coal emissions from German coal plants also kill 3000 people a year and poison the country with mercury. Well done, anti-nuclear movement. One look at the title page of “Wachstum und Wohlstand ohne Erdoel und Uran” is enough to work out that the energy transition is all about transitioning to coal with a bit of renewable greenwash. Shame that this is killing the planet. Coal emissions from German coal plants also kill 3000 people a year and poison the country with mercury. Well done, anti-nuclear movement. confirms what I said yesterday, based on French reports. Control rod drive was not used because it was not know if it was operable because of faulty position readings. Later investigation showed it would have been operable. The system for rapid shut down was always oparable as it is fully passive. Even after flooding or fire, it is always possible to cut the supply to the magnets that hold the rods up. So stories that this had failed were never credible. So of the 4 shut down systems (control rod drive, control rod drop, normal boration and emergency boration, 3 were unaffected and the 4th was possibly compromised but actually ok. Not a near miss by any description. All this information was available at the meeting of the information commission Fessenheim in October 2014. So the reports in the German press had nothing to do with transparency but everything to do with a mudslinging witch hunt. what I found particularly stunning in your article is that you cite 3 references on boration. All of these explain how boron is used in a PWR and that it is constantly present (in greatly varying amounts) in the primary coolant. Yet you chose to spin a tall tale of how the boration in Fessenheim could have lead to some damage or “aging” of the reactor. Can you give an explanation? Do you have a problem with reading comprehension? Please help me out here, I am just trying to understand how a closed mind works. In short: most emergency back-up generators are in a desolate technical situation, only 3% of the back-up emergency power systems are in a good enough state. No one wants to be fooled. There seems to be no supervision by the French state authorities , it is do-as-you-think-it-suits-you. The €50 billion announced recently needed to upgrade the French reactor fleet is probably grossly understated. It needs 2 emergency generators per reactor incl. independent infrastructure. Only 3% of the French atom power plant emergency power generator systems were fit for the purpose (at best!) during 2013/2014. If something as simple as a diesel generator can’t be maintained and inspected then forget about the rest. Keep in mind that the Swedish atom reactor fleet went broke after the check-up results for emergency power supply after Fukushima. The costs to modernize the outdated Swedish back-up systems had caused 2 reactors to close down for good, the low power prices called another 2 to the pit. Could this be the reason why the English press keeps the lid tight? and 3 minutes bore (4 minutes later with an update) L’Echos followed. It seems the reporting in the French media was already prepared but held back, only when the German media – the TV-Station reports cross border – picked it up the broader French media followed. Amazing for a story which was reported by a rel. small French news outlet last week Friday, what a journey for a home made scandal ! Hadn’t the French union leader freaked-out at the citizen’s meeting in Fessenheim the story might have never made it ….. The general news are to be found in the right column under “Breves”. Previous PostWhat will the nuclear phase-in eventually cost Germany?